I've just finished the second season of the swedish TV series Real Human (Äkta människor) and I must say that I have been hooked up by the subject and the scenario. 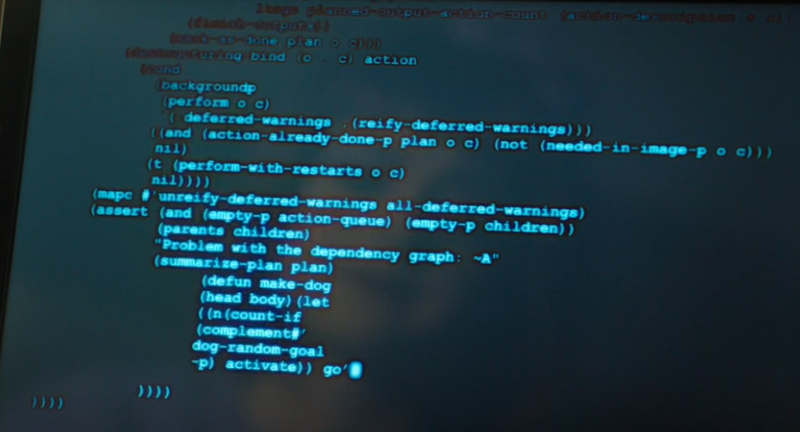 On a snapshot of the screen, we can even see a longer sequence of code. I was a bit intrigued by that: was that some real code, and if so, where did it come from? I typed a part of this code into my search engine. This code is taken from a lisp project name poiu , which is aiming at parallelizing the build process of lisp projects. So the hubots need to have a build system integrated into their own operating system. That seems logic if this code is intended to make them human, able to learn new things and experiment new feelings. Or was it just a piece of code taken from a random project?